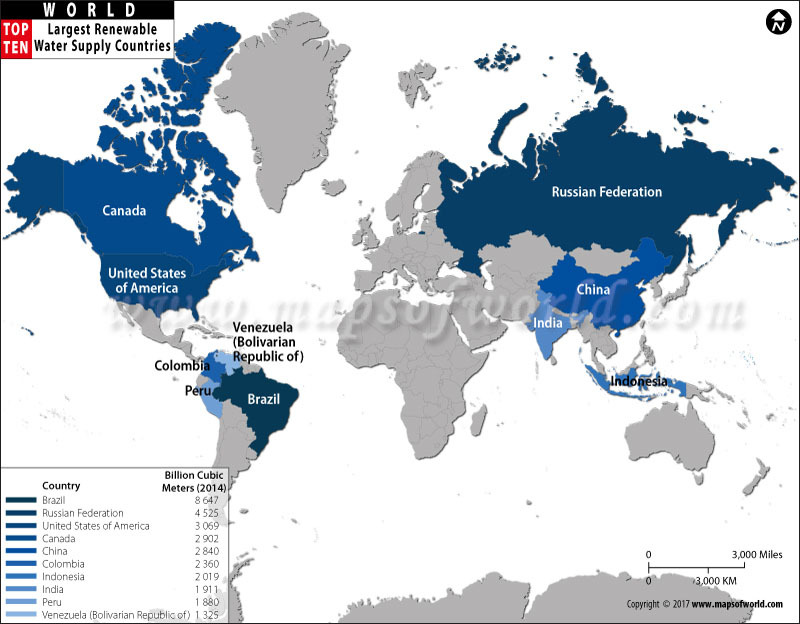 The map shows the top ten countries with the largest renewable water supply. Brazil tops the list, followed by the Russian Federation and the United States. Scroll down to know more about which countries are included in the top ten list. Amid the scarcity and disparity of water resources, only a specific part of natural water resources can actually be preserved and utilized. Although basin management helps in conservation of water resources, the practice isn’t recommended for arid areas, highly fragmented basins and large karstic zones. However, there are some countries which have significant renewable fresh water supply. Brazil with 8,647 billion cubic meters renewable water supply ranks first on the top ten list of 2014. Brazil is far ahead of the other nations as the Russian Federation, which comes at the second spot, has 4,525 billion cubic meters of renewable water resources. This is about half of what Brazil has. The United States occupies the third place with 3,069 billion cubic meters of renewable water supply. Canada, with 2,902 billion cubic meters of renewable water supply is fourth on the list while China ranks fifth with 2,840 cubic meters. Other nations that make it to the top ten list are Colombia, Indonesia, India, Peru and Venezuela.